Hillstation Property Buying Checklist - Don't Buy Without Reading This! Are you planning to buy a cottage in Ooty or Tea Estate plot in the Nilgiri mountains? 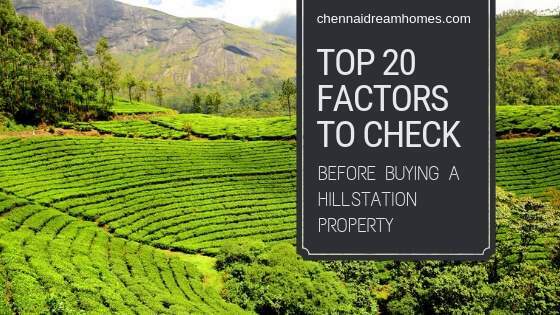 If yes, You need a Hillstation Property Buying Checklist. Plots have always been the preferred form of real estate investment as far as a healthy ROI is concerned. They have higher resale value and give positive return depending on the location, demand in the area, and infrastructure development around. Nowadays, there are excellent gated communities of plots and villas constructed by reputed layout developers, who do a good job of maintenance and provide extra amenities for a relaxing retreat. Also, Ooty real estate is still very popular and has driven up prices especially of houses. It’s also more crowded by now. However, buying a piece of land a little away from Ooty/Coonoor town centre (around 8-10 km away) will give you more affordable plots of land with stunning views and peaceful locations, to build your holiday home cottage later. Prices are constantly increasing so if you’ve been planning to invest for sometime, now is the time to start the process. The areas of Ooty, Coonoor and Kotagiri in Tamilnadu are not only the most popular areas to visit on holiday, but they are also extremely popular as a real estate investment destination among businessmen, corporate executives, NRIs, celebrities, politicians, etc. The reasons are many, of course. Location & Accessibility from the main road – How far away is it from Coonoor, Wellington, Ooty, Kotagiri, Coimbatore and Chennai? Are banks, hospitals and hotels close by? Size of the plot – Good sizes to buy a plot in Ooty or Coonoor are between 20-40 cents (100 cents = 1 acre). You want the land to be big enough to allow construction of an optional cottage later, while at the same time allowing for better market appreciation. Check the topography and soil factors if it is good for construction. Also, try to visit in rainy season to see if there is excess water stagnation. Price – Check other similarly sized plots with the same benefits as the one you’re considering. Then, compare and finalize the best plot options to shortlist and visit with your real estate agent. Is good Infrastructure in place? – Does it have water source, electricity and street lighting? Are the plots neatly demarcated, even in size, and rectangular in shape? Does it have good Vasthu? Is it fenced? Is the road width around the plots atleast 20 feet or more? Does the property enjoy good tarred road access? Does it really have stunning views as advertised? What are the annual maintenance charges like? Who will be taking care of the plot in your absence? Has the layout plan been shared with you? Plan for 1-2 site visits with your agent and ask all your doubts to ensure a thorough site inspection of the property. A good agent will let you know of both pros and cons of different properties with an objective stance to meet YOUR property needs. Are there good businesses and development nearby? Make sure there are no industries/factories next door. Verify the Sale Deed, Property’s Title Deed & Parent Document and check the entire previous ownership history of the plot in question. Check that the property has already been vetted by a top lawyer well versed in the Nilgiri market. Your agent can also get you some excellent recommendations. Check the Encumbrance Certificate (EC) if it is up to date – to verify that the land is free from all legal dues. Verify the Patta if needed. Patta contains details on the property itself, ownership history, and dimensions. It should be in the owner’s name. Reputation of the seller and real estate agency – check the background and motivation of the seller/plot promoter, and the reviews of the real estate agent who is assisting you in this transaction. If the property has been pledged on a loan, ensure you get a Release certificate from the bank which proves that the loan on the land has been paid in full. If it is a resale property, ask to check all previous property tax receipts and other utility bills to ensure they have been paid. After booking your selected plot, always make sure to register the property in your name. This is when the Sale Deed is drafted and registered, which means it legally transfers ownership rights from the seller to you. Land for sale in Ooty and Coonoor are priced more affordably than the cities and rates have also appreciated well in the last several years, with many clients enjoying either a healthy return on their plot investments, or a newly built cottage for their vacationing/retirement needs. Investing in neatly demarcated, gated plots inside layouts, (instead of individual land) is always a much better proposition. These come complete with fencing, security, water, electricity, street lighting, and road approach, surrounded by some commercial establishments like resorts, restaurants, etc. which help fetch higher returns and is appreciated by buyers today. Hence, if you find a good deal in a stunning location with lovely views, buying a plot in Coonoor / Ooty / Nilgiris today can be hugely rewarding later, as prices are already skyrocketing due to future infrastructural development. It’s not possible to get something perfect but once a majority of these conditions/preferences are met, then you can be rest assured of a great investment on a land for sale in the Nilgiris. We hope you find this Hillstation Property Buying Checklist useful as you embark on your search! The Ultimate Guide to Buying a Hillstation Property in India!